NEWMARKET — Priscilla Schanda and her late husband Richard are institutions in town with the picturesque Schanda Park named after them for their contributions to Newmarket. Schanda, 88, is known for staying active around her home and in the community and she was able to keep up with her housework up until last year when she would still be seen chopping wood and clearing brush in her yard. 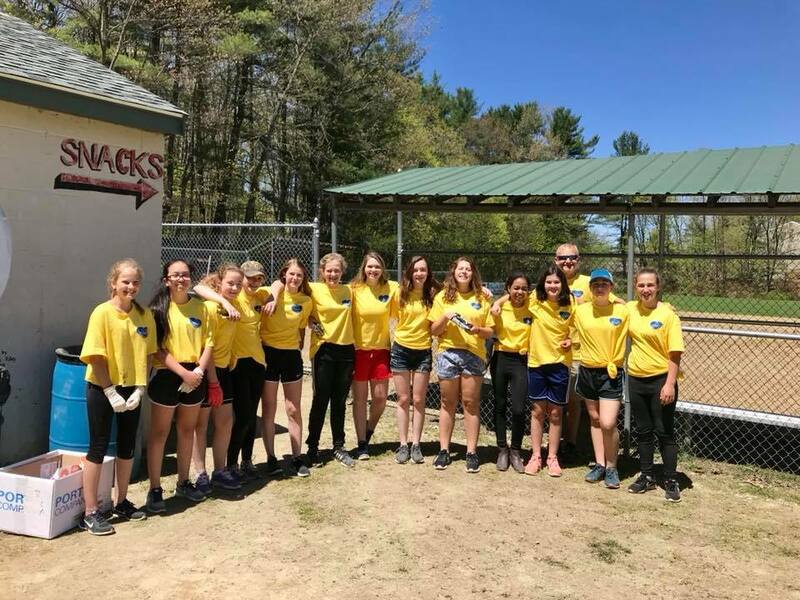 On May 11, Schanda was on the receiving end of the generosity as a small army of 60 Newmarket students and community members joined forces for the first annual Newmarket Cares Day. Students and community members dispersed into the town’s public spaces and private homes of elderly residents to help them with yard work. Students enjoyed a half-day of school and many decided to pitch in and help their town. The effort was organized by Rev. Patty Marsden of the Newmarket Community Church and Kathi Al-Darraji from the Newmarket Junior-Senior High School. Marsden said she wanted to launch a town-wide effort to clean up the community since 2014. Teams of students and community members, including local groups such as the Newmarket Business Association and Blooming Newmarket, were dispatched to the Ashswamp Road Public Garden, Schanda Park, Beanie Howcroft Field and Newmarket Library Public Garden to clean up brush and beautify the areas. In addition to Schanda’s home, volunteers worked at five private residences belonging to elderly people. Newmarket Town Manager Steve Fournier said Newmarket Cares Day was just the latest example of Newmarket reinventing itself as a community continuing to prosper. Marsden said Newmarket Cares Day sponsors included the Newmarket Community Church, Newmarket Lions Club, American Legion Post 67, TD Bank, Aubuchon Hardware, the town of Newmarket, the junior-senior high school and St. Mary Church. She said the Lions Club paid for the lion yellow t-shirts all volunteers wore while they were working. Kristie Blanchard, of the Newmarket Business Association, said she wanted to help out because Newmarket Cares Day was a chance for community members to lead by example. Aniya Bryant, a seventh-grade volunteer, said she wanted to take her afternoon off from school to give some of her time back to Newmarket. "A really organic Newmarket Night Out"
"Community Church Christmas Fair this Saturday"